An architectural survey of one of the oldest individual labourer's cottages in the parishes of Ditteridge and Box. Shepherd's Close is a Grade II Listed Building located in the hamlet of Ditteridge, and is described on the English Heritage website as being of seventeenth and eighteenth century, rubble stone with a thatched roof, coped gables and east end ashlar stack to original range and lower east extension with stone tiled roof. One and a half storeys. 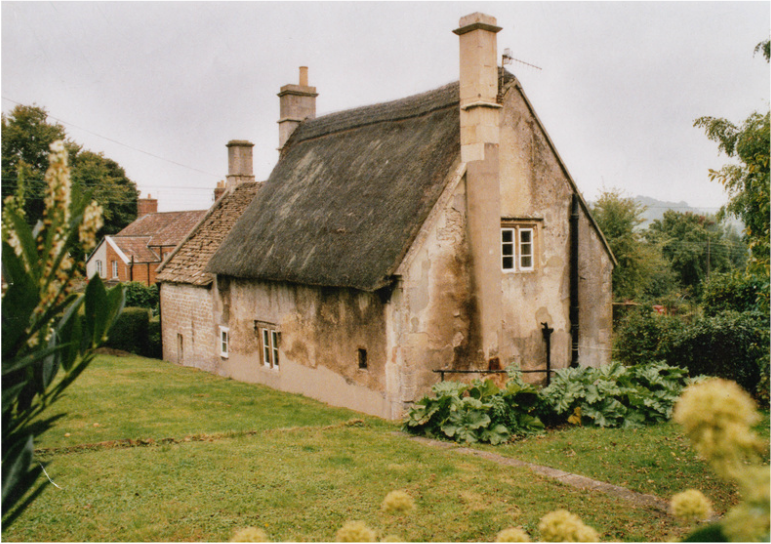 In fact it didn't begin life as one property but rather as two; the main range dated to the latter 1600s, and the lower cottage mid 1700s. The main range consisted originally of one hall room, with a large inglenook fireplace, a small solar or pantry, and a newel staircase leading to an unheated upper room. The lower cottage consisted of two rooms, with a fireplace in the lower room and a wooden newel (quarter-turn) staircase. The cottages remained as two separate dwellings until sold by the Northey Estate in 1964. Until the mid-1950s neither had piped water, relying instead on a spring in the roadway outside, no electricity and no inside sanitation. There is a stone privy on the boundary, which was shared by both households. The sewage was not connected to the mains until 2002. The name of the house Shepherd's implies that it was a farm labourer's house and the use of the word Close suggests that it was a dwelling carved out of a larger area. Sometimes the use of Close rather than Cottage is extremely old and, of course, the Ditteridge hamlet has Saxon origins. But the naming of houses in the hamlet was rare. I have census returns for Ditteridge from 1841 but, at present, I haven't identified exactly who lived in each house, beyond that of knowing that in the later census returns the occupation of the head of the household was given, and if it was shepherd then this is the right house. The earliest person I have positively identified living in the cottage in the 1920s and 1930s is Elizabeth Pillinger, the grandmother of Francis Pillinger, but many of the people who were mentioned in the censuses lie in the churchyard of St Christopher's, a hundred yards from Shepherd's Close. 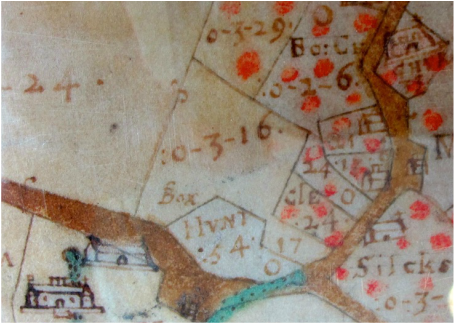 Francis Allen's map of 1626 (below left) shows divided house plots in the area but no house in the plot for Shepherd's Close opposite the barn. The 1840 Tithe Apportionment map (below right) is clearer but still no individual reference to the property (both maps courtesy Wiltshire History Centre). The lack of visibility was partly because the property was a very small part of the Northey Estate which presumably did not bring in much rental income and was of minor importance. The first time that it is clearly shown on a map is in the second edition of the Ordnance Survey in 1904 (courtesy Wiltshire History Centre). Although we cannot trace the early history by either the names of the tenant or by contemporary maps, we can date the building by its architectural development since the earliest surviving remains of the the present building. The property has had five phases of development that can be separately identified: phase 1 in 1670-80, phase 2 in about 1750, phase 3 in 1964, phase 4 in 2001-02 and phase 5 in 2007. The exterior walls are of oolitic limestone, laid in coursed rubble, with coped gables and squared quoins on all four corners. The original eastern gable is of ashlar, as can be seen from the inside. 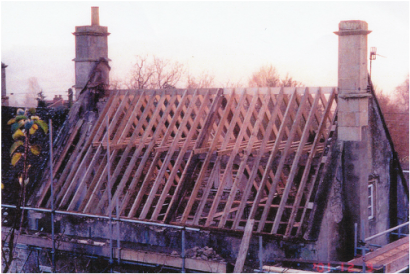 There is some evidence of fire damage to a few of the ashlar quoins, but certainly at no time was the house burnt down (a considerable risk for thatched cottages) as can be deduced because the rafters were original. Perhaps the quoins were reused from another house. One of the most prominent features is the thatched roof on the main range. On the south side there are two thatched gabled dormers. Although the window frames themselves have been replaced with wood, four original window openings and surrounds survive (and possibly five). These are two-lights, with recessed ovolo mouldings, and drip moulds. The mortar seems to have been originally buttered but it is difficult to tell as the walls have been repointed many times over the centuries. I am puzzled by the window on the south wall. It has three lights, a beaded moulding on the outside, splayed on the inside, signs of wooden glazing bars, a continuous plain drip mould with no labels, but seems to have been inserted before the porch was built, because the porch overlaps the stone surround. I think it unlikely that it was altered after the porch was built, as there is no reason whatever why it could not have been placed a few inches further over, thus avoiding the overlap. Pam Slocombe thought that the porch and the lower cottage were built at the same time - certainly the finials are identical and the purlins are not sawn - so a date of mid-1700 would seem likely. The window may, of course, be the original one, as Nat Alcock and Linda Hall list beaded mouldings dated 1683, and add that they are very common but rarely recorded. Date range uncertain. The window lighting the staircase may be of a later date. It has a wooden lintel, and it appears that the stone courses have been cut. There is a small opening in the pantry wall, only visible from the outside. Possibly this was made when a larder was installed by Stuart Hills after 1964, but the stonework looks eighteenth century. The internal frame is aluminium. The original doorway is now covered by a 1700s porch, but was a plain square stone opening, with a wooden frame, with chamfers. The door is not original. It is possible that the original entrance door consisted of three planks. This would be consistent with the date of the house but there is no way of proving it. The roof covering is of long-straw thatch, with 26 inch hazel rods, or liggers, holding the ridge in place. Because of the extent of later refurbishment, there is considerable need for guesswork, but the basic layout is clear. The main range consisted of an outer door opening into a hall, with a large inglenook fireplace, and a doorway into a smaller, unheated room. To the left of the fireplace was a newel staircase leading to an unheated upper chamber. 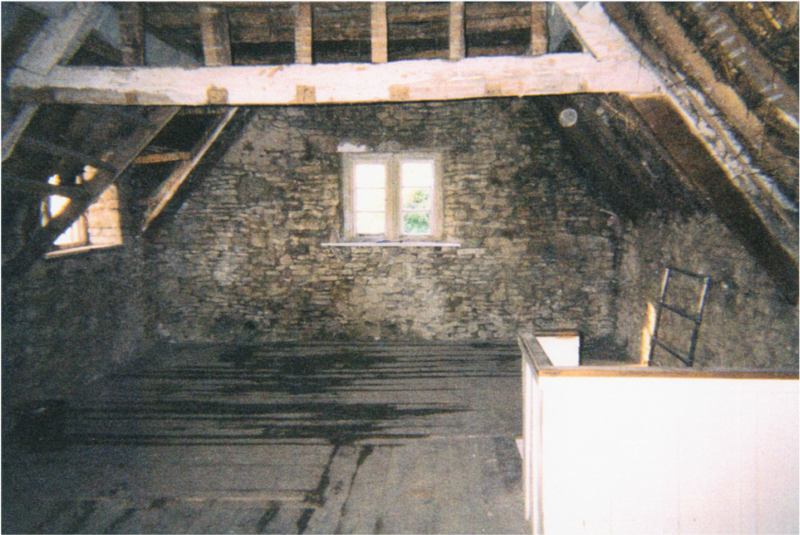 This appears to have been partitioned, and the attic floored, with principal rafters and substantial threaded purlins (two pegs).The collar beams were removed a few years ago to raise the ceiling height. The purlins are roughly cut, and still have bark adhering to them. This was not a high-status house. The hall was lit by two windows, one on the north side and one on the south. The northern one has mullions with ovolo mouldings; the southern one has splayed stone mullions. The hall ceiling is supported by a massive oak beam, 9 inches wide. As a lowered ceiling has been inserted to take down-lighters, I don't know how deep it is. The floor level above is 6 inches higher than the ceiling, so allowing for 2 inches for floorboards that would make the beam 10 inches deep. Chamfered, it has simple moulded stops, consistent in this part of Wiltshire with a date of 1670. The beam extends for the length of the hall, supported on the outer wall above the fireplace and the internal wall between the hall and the pantry, which appears to be built of solid stone. There is no sign that the beam extended across the pantry. 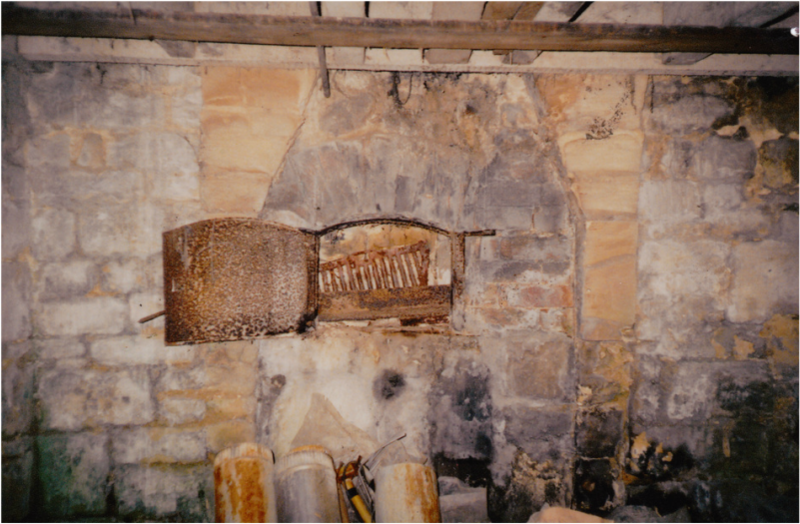 The fireplace has a chamfered wooden bressummer, approximately 10 inches deep by 8 feet long, with stops, resting on stone jambs, consistent with a date of about 1670. The stone jambs are badly damaged. Openings in the wall on both sides of the fireplace have been filled in, and, although I cannot be sure, there appear to be two places where a bread oven might have been. The jamb to the left of the opening has been cut back by about 30 inches, to make room for a doorway into the lower cottage. Upstairs, the chimney breast is wider by this amount. Perhaps this is why the openings were filled in - to strengthen the jamb to support the extra weight upstairs. There are nine separate and distinct burn or witch marks on the bressumer (horizontal timber beams) - the original builder wasn't leaving anything to chance. The newel staircase led from the north-east corner of the hall to the upper chamber. The curve in the wall is still there both upstairs and downstairs, but, as has been mentioned above, the opening upstairs is considerably smaller. Nothing remains of the internal fittings of the pantry except the window, and I have deduced the position of the doorway from the fact that the wall to the left of the present staircase is hollow, whereas the rest of the wall is solid. The cottage consists of two storeys, one room on each floor, with a fireplace on the ground floor. It is built of oolitic limestone, dressed stone, with ashlar quoins. On the southern side there are several larger blocks with markings which may have been recycled from another building. The roof is of stone slates. On the south side, the left-hand window replaces a door. There are two original windows on the ground floor with ogee mouldings, and in the upper room, one window on the south side and one in the gable end. Nothing survives of the interior except a small portion of moulding round the chimney breast, one beam running north-south on the ground floor and two principal rafters on the first floor. Here again, a collar beam has been removed to raise the head height, but the peg holes are still visible. Assuming (and it is a big assumption) that the porch was added to the main range at the same time as the lower cottage was built, it would date to about 1750. It seems rather big and grand for a small house, and overwhelms the south front. The porch is built of oolitic limestone, with a stone slate roof, one small window, constructed mostly in coursed rubble, but with some areas of ashlar on the corner near the doorway, presumably to strengthen the opening. The door has a wooden frame, roughly chamfered and stopped. The door is a modern replacement; there is a photograph of an earlier door, with eight panels. The interior is plastered, with two softwood purlins and a false ceiling. The window opening is irregular. In 1956 the Northey Estate was sold and the two cottages were bought by Stuart Hills a few years later. 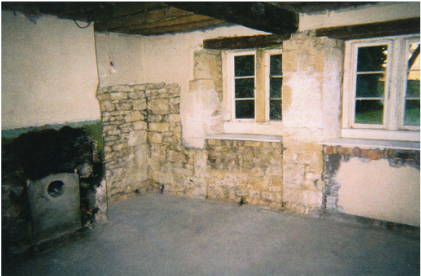 A doorway was inserted on the end wall of the main range on both floors, to give access to the lower cottage. At the same time, the chimney jamb to the left of the inglenook was cut back, and a winder staircase relocated in the north-west comer. The staircase in the lower cottage was also removed, and the doorway converted into a window. A range was fitted into the pantry and a chimney constructed on the west gable end. Upstairs, as the water supply had at last been connected, a small bathroom was installed, draining into a cesspit in the garden. The old privy in the garden was used for housing pigs and storing coal once the inside wc was installed. Elsewhere on the website are details of the Pig Club run by Stuart Hills, who owned the house from 1964 until his death in 1999. In 2001 the property was bought by John Elwes and considerable repairs and alterations were carried out, including the building of a large conservatory on the western gable end. Unfortunately this work destroyed some of the house's historic features but some excellent touches make this house a joy to live in. The exterior remains fully recognisable to previous owners, with the exception of the removal of the extra chimney, the wholesale excavation of the vegetable patch to provide parking, and the erection of a large conservatory. The staircase has been turned round, and the layout of the bedrooms and bathroom altered, the ceilings raised upstairs, and down-lighters, necessitating false ceilings, installed throughout. Both roofs were stripped back and the rafters replaced, a stone floor - with underfloor heating - installed in the hall, parlour and conservatory. A new opening was made from the hall to the parlour, a kitchen fitted, and a large opening leads from this into the conservatory. In 2005 I bought the property and, apart from improvements to heating and insulation and considerable work on the garden, have only made one major change. This is the addition of a single storey wc and a new entrance to the house, a back door to the north of the conservatory. It owes its circular state to the planners' curious insistence that I should disguise it as a bread oven. However, it is built of recycled limestone, with stone slate tiles sourced with difficulty from the other side of the county. There is an outbuilding on my land, officially a garage, but in fact the village bakery, complete with its oven. I haven't found any other information about it, although this would help to identify life and residents in the medieval hamlet. Also needing research is the exact position of the medieval village. 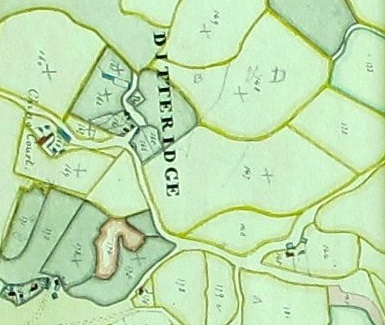 The hamlet of Ditteridge, all twelve households, is a happy, friendly place, making incomers welcome, and still containing families who have lived here for three hundred years or more. Shepherd's Close, as the oldest surviving house barring Cheney Court, bears witness to the continuity of village life despite the upheavals and setbacks over the centuries. Long may it last.